WASHINGTON -- Apparently, the Washington Nationals aren't ready to concede. Playing their first game after the non-waiver trade deadline, the Nationals trounced the New York Mets25-4 in a game that not only gave Washington a franchise record for runs scored but also marked New York's worst loss in its 57-year history. It got so bad for the Mets that veteran infielder Jose Reyes came on as an emergency reliever and allowed six runs in the eighth inning. For the Nationals, the runaway triumph capped a wild 24 hours. Washington was thought by some to be a potential seller ahead of Tuesday's 4 p.m. ET deadline, and even star outfielder Bryce Harper was mentioned in trade rumors the previous night. But Harper stayed put, then collected a pair of RBI doubles as part of the offensive barrage. Washington became just the 10th team in MLB's modern era (since 1900) to score 25 or more runs in a home game, according to Elias Sports Bureau research. The 21-run win also was the largest in Nationals/Expos history, according to ESPN Stats & Information. "It was pretty exciting," Nats manager Davey Martinez said. "They came out to play today. Good at-bats all day. Tanner [Roark] pitching the way he pitched was awesome. Just all around a good day. Been an emotional day -- good way to end it." Facing New York starter Steven Matz, the Nats were locked in from the start, batting around and scoring seven times during a first inning in which leadoff man Trea Turner collected two hits and two steals. Just hours earlier, it was Turner who made news for other reasons; he met the media and apologized again for offensive tweets he made in 2011 and 2012 that surfaced over the weekend. The Nationals, meanwhile, proceeded to score three runs in each of the next four innings, becoming the first team since the 2011 Rangers with at last three runs in each of the first five innings. The 19-0 lead through five innings marked only the second time that has happened in major league history, according to Elias research. The first occurrence was on May 13, 1876, when the Hartford Dark Dukes held a 21-0 lead over the New York Mutuals through five innings. "The scoreboard kind of spoke for what the offense did today," said Murphy, who's now hitting .391 with 11 home runs and 43 RBIs in 38 starts against his old club. "I think from the first at-bat of the game with Trea, and all the way through that first inning and through the whole game, even when Jose came in and pitched for them, we were still grinding out at-bats. All you can do is control the effort and make the choice to engage in every single pitch. Hopefully we will continue to do that, and I think we will." Washington's final six runs came off Reyes, who became the 38th position player to take the mound this season, the most since the beginning of the expansion era in 1961. Reyes made the first pitching appearance of his career, and the 35-year-old infielder got tagged for home runs to Matt Adams and Mark Reynolds in a six-run eighth. Throwing a fastball in the mid-80s and a curve in the upper 40s, Reyes gave up five hits and walked two. He also plunked Ryan Zimmerman with a soft toss. After getting hit in the leg, Zimmerman playfully faked a charge toward the mound, drawing a laugh from Reyes. "When you're on the mound, before you throw a pitch, it is fun," Reyes said after his 48-pitch night. "But when you start to see people hit a homer, you get more serious, because even though I'm not a pitcher, you don't want to see that." Zimmerman collected a pair of hits, including a two-run homer that was one of five Washington round-trippers. His RBI single in the first inning was the 1,695 of his career, moving him past former Expos infielder Tim Wallach for most hits in franchise history. "You don't have the ability to play in one place if there's not a good relationship both ways," said Zimmerman, who in 2005 became the first player drafted by the Nationals following their move from Montreal. "A player obviously wants to play here, but the organization has to want you here as well to be here for 13 years or however long it's been. Obviously proud of it. It's a nice accomplishment. But I think more should be about being able to be here as long as I can. I respect that a lot more than the actual record." Even winning pitcher Roark (5-12) got into the act. 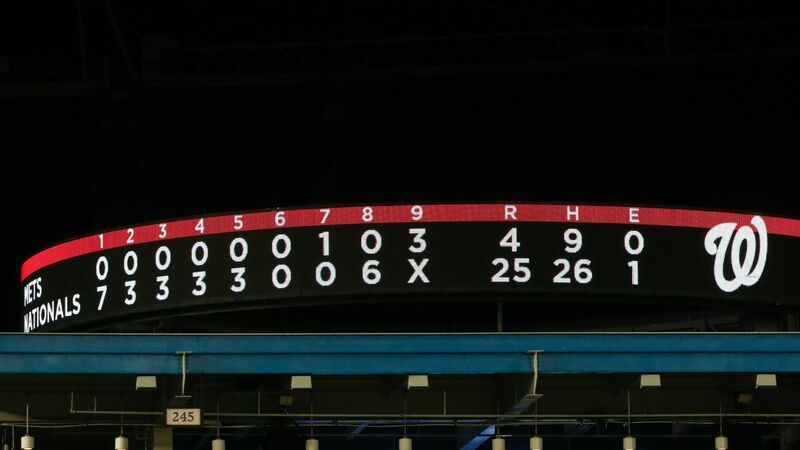 Besides limiting the Mets to a run on four hits over seven frames, the veteran righty went 2-for-5 at the plate, including a bases-clearing double off of Matz that concluded the scoring in the first inning. "He's thrown me a sinker inside before,"Roark said. "I've gotten broken bat or jammed, hurt my thumb big time. So I was looking heater, got heater and just hit it. Squared it up." "I was just trying to get through the inning and get the game over with," Kelley said. "I thought everybody had seen enough baseball for one evening." "You should never throw your glove. We should act like adults," he said. As for the Mets, it marked another low point in a season full of them. Their previous worst loss was a 26-7 pounding by Philadelphia in 1985. This game got so out of hand, Mets television announcers Keith Hernandez, Ron Darling and Gary Cohen took turns reading verbatim from the team's media guide in the late innings -- the SNY network played the theme from "Masterpiece Theatre" in the background. "Tough loss," manager Mickey Callaway said. "It's embarrassing. We've got to do better. ... We made way too many mistakes tonight, and they weren't missing. "Nobody wants to lose like that. We all want to win games. It's a bad loss." With the Mets down 19-1, Jose Reyes pitches and gives up two home runs, hits a batter, and New York falls 25-4.